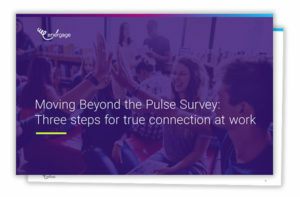 It’s time to adopt a more comprehensive, integrated approach to connecting with your employees and building your organization’s culture. We’ll show you how. 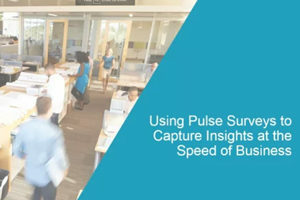 Pulse surveys are a quick way to capture employee opinions and gauge employee engagement. And there’s nothing wrong with that. But it’s time to expect more. Annual surveys are effective at capturing employee feedback and identifying big-picture opportunities for improvement. But as the speed of business accelerates, it’s becoming increasingly difficult to take action through traditional methods such as focus groups, town hall meetings, or even ‘management by walking around’. Employee engagement is a key driver of retention, productivity, quality, and more. But despite efforts to improve employee engagement, rates remain stagnant in most U.S. organizations — except for an elite group of standouts.